After integrating Google+ in YouTube YouTube's Comments Section Now Cleaned Up, Courtesy Of Google+ YouTube's Comments Section Now Cleaned Up, Courtesy Of Google+ Google has cleaned up YouTube with a new Google+ powered commenting system. You'll now see the most upvoted comments, the ones from people in your Google+ circles, and from the owner of the video. Read More for your comments, the search giant is now turning towards Gmail to give its social network some more visibility. 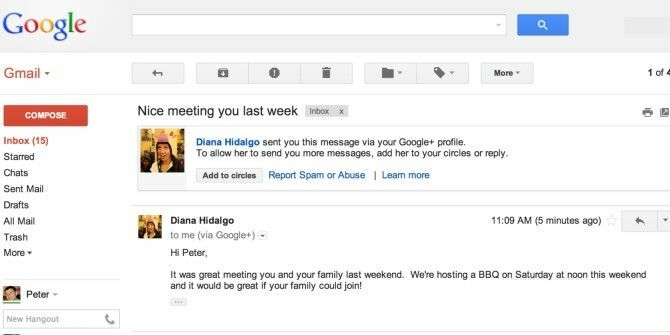 From today, any Google+ user will be able to send you a message on your Gmail. To send a message, all you need to do is add that person to your Google+, whether they’ve befriended you or not. If the two people are in each other’s Circles, the email will be filtered to the Primary inbox in Gmail’s new Tabs view. If they aren’t part of each other’s Circles, it will get filtered to the Social tab. Thankfully, Google is offering the ability to switch this feature off. Go to your Gmail’s Settings and in the General tab, you will find an option named “Email via Google+: Who can email you via your Google+ Profile.” In the drop-down options, you can choose “no one”, “circles”, “extended circles” or “Anyone on Google+. As Justin has previously written, Google’s new tendency to add Google+ to everything can be quite annoying OK, Google: We Get It. Just Go Ahead And Add Google+ To Everything. [Opinion] OK, Google: We Get It. Just Go Ahead And Add Google+ To Everything. [Opinion] Don't worry Google, I think you can get everyone onto your network in just a few months if you really push. Here are my suggestions. Read More . What do you think about it, and this latest move? Explore more about: Gmail, Google Plus. If you run Google Apps (personal, education, etc), you can turn it off at the domain level. Now my family doesn't have to worry about the possibility of getting unwanted email via Plus. Bad. I switched to Outlook. Its much better. No one wants Google+.